Posted on October 17, 2017 at 2:44 pm. With a new middle school opening in September of 2019, APS is resetting middle school boundaries to create a new boundary for the new middle school at Stratford; relieve crowding at some schools; and balance enrollment among all six middle schools. Learn more about the process in this episode with Coordinator of Community Engagement Kathy Mimberg. Click here to listen to the podcast. The What’s Up, APS? Podcast is an inside look at Arlington Public Schools. 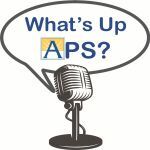 To ask a question about a previous pod or to suggest a topic for a future episode, email apsnew@apsva.us. The podcast is available for download an to subscribe on iTunes and Google Play.